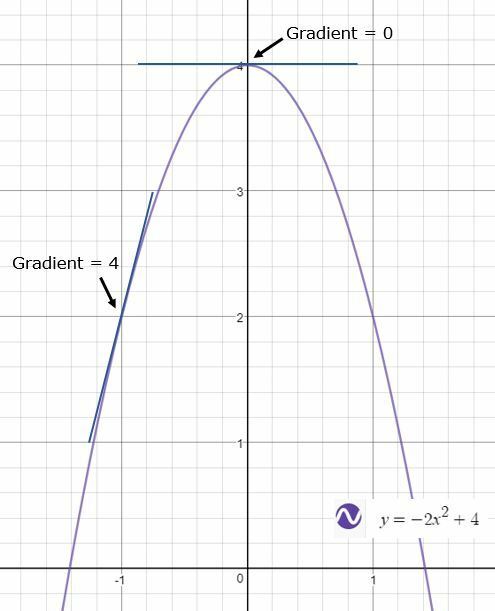 Calculus helps us to understand the gradient of a curve. The derivative gives us a ‘gradient function’ i.e. a formula that will give the gradient at a point on the curve. The gradient on a curve is different at different points on a curve. When the gradient is positive. When the gradient is equal to zero. When the gradient is negative. To find the gradient function (derivative) for a model or graph we differentiate the function. The technique of differentiation can be carried out using algebraic manipulation. Find out more about algebraic manipulation such as rearranging equations and the law of indices. Khan academy step though this power rule with a number of examples. The following video will take you through three more examples of differentiating polynomials. Practice this technique on Khan Academy. Hints and further videos are available. There are three commonly used notation methods for the derivative of a function.